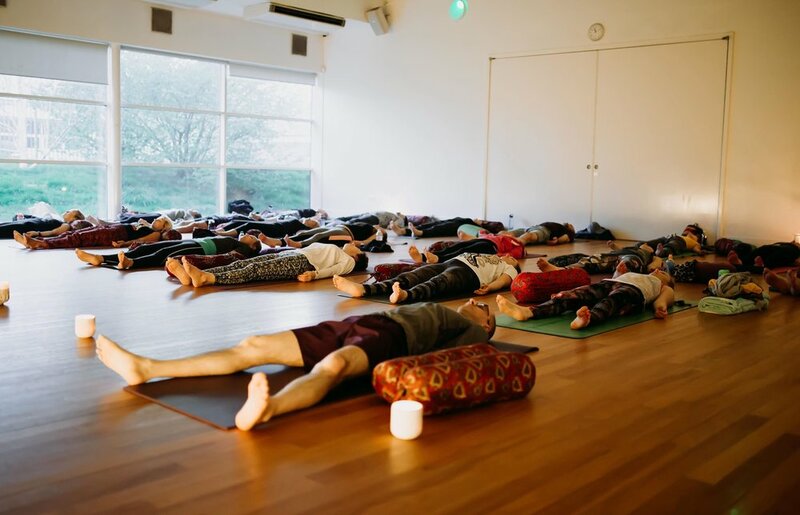 We will go on a two hour journey into stillness, releasing built up stress, tightness and emotions from our bodies with Yin Yoga, which will be guided by Toma. To help us surrender & let go on an even deeper level, Christine will share the healing sounds of her crystal singing bowls. The evening will end with a guided meditation to leave you all blissed out for your Saturday! About Crystal Singing bowls: Vibrational sound touches our bodies on a molecular and crystalline level. Studies have shown that sound has a direct impact on the mental processes, muscles, nervous system, (heartbeat, pulse) digestive system and circulatory system. Alignment with the tones of the Crystal Bowls is one of the most dynamic forms of sound healing found today. How do you feel about the life that you are living right now? Don’t like what you see? Maybe you are feeling ok, but would like to have/experience more? We are all a product of our thoughts. It is our own thoughts and energies that are continually creating the very life around us. If you don’t like something, you have the power to change it and create a different reality. Join me on Sat, 15th Dec 19.15-21.00 in Dagenham, where I will be explaining all about the process and give you the exact steps to start creating/manifesting. We will be calming the body and mind with a gentle but powerful Yin Yoga practice. We will put pen to paper for intention setting, so we can attract/manifest your heart desires and learn how to create the life you want...To seal the evening and amplify the energy, you will be guided through a meditation to get you into Theta state, where all the magic happens! Join me to end the year with a little bit more magic and create some more for the years to come! Raw ceremonial grade cacao has been used for centuries to unlock the heart, release trauma & emotions that you knew or didn’t know existed within you. You will be guided by a Shaman who is visiting all the way from Mexico - Carlos Mundalah. He will take you on your universal love journey! Chocolate, Yin , Transformation, live guitar music & chanting! Who can say no to that?!?! This is an opportunity for you to connect within, set your intention and allow it to aid you in any transformational shift you are working towards. If you have a calling to attend, but genuinely struggle financially, please get in touch. If you are taking anti depressants, SSRI's or any other medication. If you have high blood pressure, a heart condition, as cacao increases the blood flow to the brain and heart by at least 40%. Slow down..pause..breathe..observe..nurture the whole of YOU with Yin Yoga & Crystal Sound Healing. I am so very excited to pair up with my beautiful energy healer, Lina Philipps and introduce the power of holistic healing and living to all of you! Through Yin Yoga, you will learn to observe your thoughts, cultivate stillness in the body and mind. Yin Yoga nourishes the body by providing the vital chi (life force energy), which removes blockages and opens up pathways and meridians. At the same time, crystal sound healing will penetrate to your very cells and rebalance, heal and restore your whole being. Both will assist to access deeper layers of the physical, mental & emotional self. The human body and the entire earth are made up of energy, vibrating at different frequencies. When out of rhythm, disease and disharmony result. Therefore vibrational sound healing addresses these imbalances or blockages of the energy channels. Crystal bowls work directly with the universal energy and helps us to channel this within us, to enliven, waken, heal, restore every layer of our being. Studies have shown that sound has a direct impact on the mental processes, muscles, nervous system, (heartbeat, pulse) digestive system and circulatory system. Alignment with the tones of the Crystal Bowls is one of the most dynamic forms of sound healing found today. Earth Day - Evening of Yin Yoga + Guided, Powerful Ancient Breathing Meditation "Ananda Mandala"
Celebrate Earth day on 21st April, by joining me for one of the most powerful evenings to be guided through Yin Yoga and finish the evening with one of the most powerful ancient breathing meditation practices called "Ananda Mandala". Not to be missed! This is for those who would like to experience the true power of what we are capable of. Yin Yoga - You will be guided through a relaxing Yin yoga practice ( no experience necessary and beginners are welcome). Yin yoga is a passive, slower paced yoga; where postures are held for longer periods of time (4-5min) in a relaxed body and muscle state (using props like bolsters and blocks, to support and comfort in the pose). It is believed, that Yin helps to regulate the flow of energy in the body. We will be holding stretches to access deeper layers of fascia (connective tissue). Yin yoga cultivates, stillness of the body and mind as well as physical ease. This style of yoga is also suitable for people with pains, injuries. Yin will bring back balance and a floating on cloud 9 sensation to the whole of your being..what more could you want for a Saturday night? I am so excited, overwhelmed and all other emotional feels at the same time, to bring this special evening to you. I know this will shift a lot of things for most, as my journey with this for the first time, was absolutely mind blowing. I am so looking forward to hearing all about your individual journeys and looking forward to seeing you & sharing this beautiful experience together! Please bring your yoga mat - (Limited spare yoga mats available please message in advance to reserve), Bring water, comfy clothes for yin yoga + socks and blanket for relaxation at the end. Please arrive 10 minutes before start time. Tickets must be purchased online as spaces are limited. Join me on a 2 hour Yin/Yang workshop, where we will practice, explore, learn and balance the Yin & Yang in us. Starting off with a 20 minute Yang practice, to warm up the muscles and get the heart pumping. We will then look into correct & safe body alignment in sun salutations and poses like chaturanga & triangle (trikonasana). You will gain wisdom and experience on how to implement this for a safe and an enjoyable yoga practice. Learn about Ujjayi breath (pronounced oo-jai), commonly translated as "Victorious breath" and is also referred to as the "Ocean breath" due to the sound it provides when performing the breathing technique. Find out step by step how to perform this to enhance your practice and how it will benefit you. Slowly we will transition into exploring some of the Yin (restorative) yoga poses, anatomy and how you can practice and modify the poses to suit your body structure. 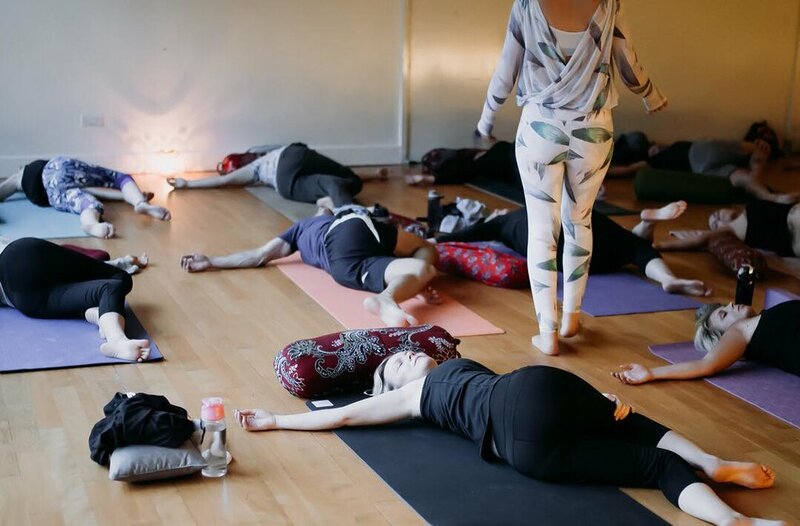 Finally we will end the session to get you completely blissed out for the rest of your Saturday, with a 1 hour restorative Yin Yoga practice and a guided meditation. *This workshop is suitable for all levels and is a great way to enhance your knowledge, for a safe yoga practice. Please get in touch should you have any questions.